Rootstock and dried rhizome. Not to be used without medical supervision. Designating a family of dictyledonous herbs, shrubs, and trees, including frangipani and periwinkle. Dogbane is a bushy, shrub-like, perennial, hairless plant with tough fibrous bark on the stems, exuding milky latex juice when broken. A large, horizontal, milky rootstock sends up a glabrous stem with tough, fibrous bark to a height of 1-4 feet. The leaves are opposite, roundish to oblong-ovate or ovate, dark green above, lighter and hairy beneath, and grow on short, reddish petioles. The nodding bell-shaped, drooping, fragrant flowers grow in terminal cymes and are pink outside, pink and white striped inside or pink with red markings inside. Blooming time is May to August. The fruit is a pair of long, slender pods. All parts of the plant contain a milky juice. This plant, dogbane, differs from its close relative Indian Hemp (A. cannabinum) in that its leaves are mostly sessile (stalkless), and the flowers are both in leaf axils and terminal. Another plant is also called bitterroot (Lewisia rediviva) was commonly eaten by the Native Americans in Montana. 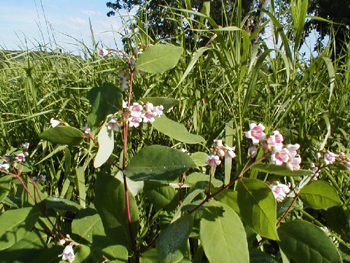 Dogbane is a native perennial plant found in both the Atlantic and Pacific coastal states, in dry, sandy soils and around the edges of forests. Less commonly on roadsides and in fields. Newfoundland to Georgia and Arizona. Absent from Kansas and south of North Carolina highlands. Dogbane is so named, they say, because it is said to be poisonous to dogs. In North America there are 60 species. No side effects have been found from the proper administration under medical guidance. Not recommended for use without medical direction. 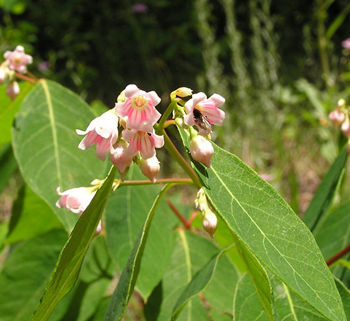 Dogbane has been used to relieve dyspepsia, constipation, fever, gallstones, and dropsy. Used in treatment of liver disorders. Given in large doses, it is cathartic and emetic and may cause other symptoms of poisoning. When used, it is generally combined with less harsh medications suitable for the intended purpose. A diuretic in dropsy after heart failure. Hemp dogbane is used in medicine in the treatment of heart failure but even in small doses it is dangerous. Native Americans used the root of dogbane for many ailments. It induces sweating and vomiting; laxative. Used in headaches with sluggish bowels and syphilis. Infusion: Steep 1 tsp. rootstock in 1 pint of boiling water. Take cold, 2 to 3 tsp. 6 times per day. Tincture: take 5 to 10 drops in water before meals. Poisonous. Cymarin, a cardioactive glycoside, poisons cattle. Eating the leaves has killed the livestock. The milky sap has been used safely externally as a remedy. The plant has shown anti-tumor activity.